I know it's still pretty cold (and even snowed) in other parts of the country, but it's quickly starting to warm up here in Charleston, and it has me thinking on spring! But don't get me wrong, I am definitely not ready to give up my sweaters just yet! Thank goodness we have great boutiques like Pink Lily and Red Dress that are already sharing some of the cutest sweaters that are perfect for Valentine's Day and wearing into spring! How perfect are these sweaters?! The great thing about them is that you can wear them now with darn denim and a warm coat, as well as transiting into spring with white denim or even a pair of shorts for those cooler spring nights! These sweater's definitely won't last until spring, so snag them now before they're gone! 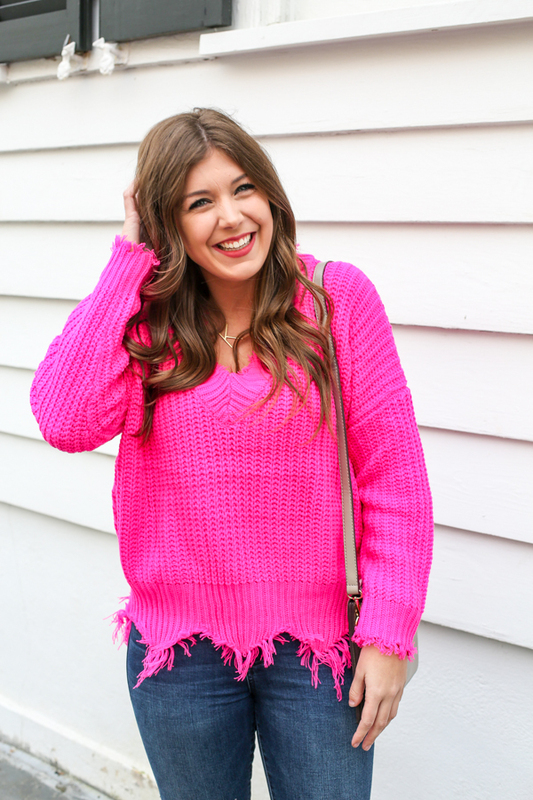 I can't wait to wear this pink sweater for a comfy Valentine's Day look! 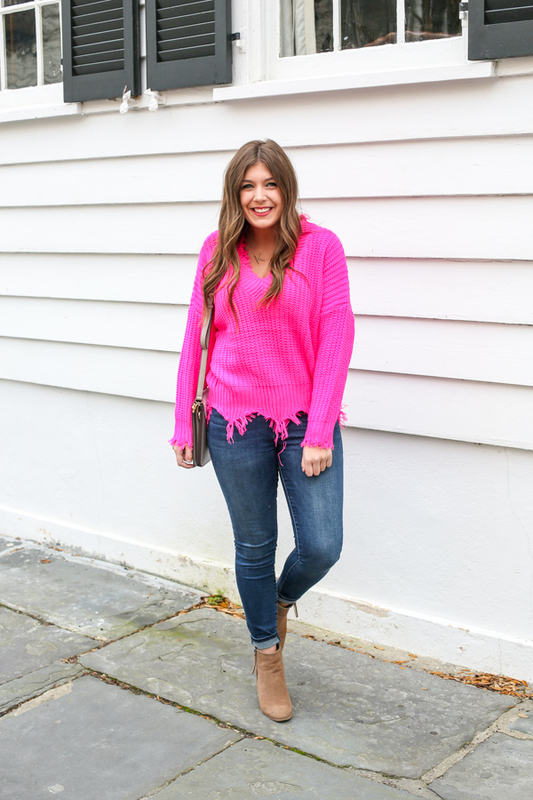 White denim will definitely be acceptable here in Charleston by mid February, so you will definitely be seeing me pairing this sweater with some white jeans! I'm kind of in love with this color on you!!! Wear it all the time please and thank you. You look so gorgeous!! I have the hot-pink sweater and am obsessed with it. Love these picks! You picked out the cutest sweater! Love the hot pink - makes Winter a little more cheerful! Your sweater is adorable! And I am crushing so hard on that blue one you shared! You are seriously rocking that vibrant pink! I love it on you, girlfriend. I gotta get my hands on some of these fabulous sweaters. Obsessed with this pretty pink sweater on you! It's the perfect piece for Valentine's Day! What a fun sweater! I love the bold pink shade, it's really perfect for Valentines! Love the frayed ends. IT's so cold I am def in the mood for sweaters! I love the fringe detail on your sweater. You look gorgeous! There’s nothing more perfect than an oversized sweater. It’s my favorite winter staple. Such a great color ... makes me happy on this chilly winter day. I love the hot pink and raw hem of that sweater, so cute!! The raw hem on that sweater just makes it so Fab!